The R-M55H metal ring roller is a very powerful bender capable of rolling 2 inch Schedule 40 pipe, or 2 X 2 inch (.187) angle iron in mild steel. This model has a power requirement of 220 volts, single phase, so it literally can work in any fabrication shop or on any job site. The R-M55H has a powerful direct gearbox drive system that delivers full torque when bending at full capacity. A Sieman's inverter drive protects this metal ring roller when bending at full load. The inverter drive allows this ring roll to provide variable speeds. A variable speed machine really comes in handy when dealing with different materials. Adjustments to this benders speed can be made on the fly. 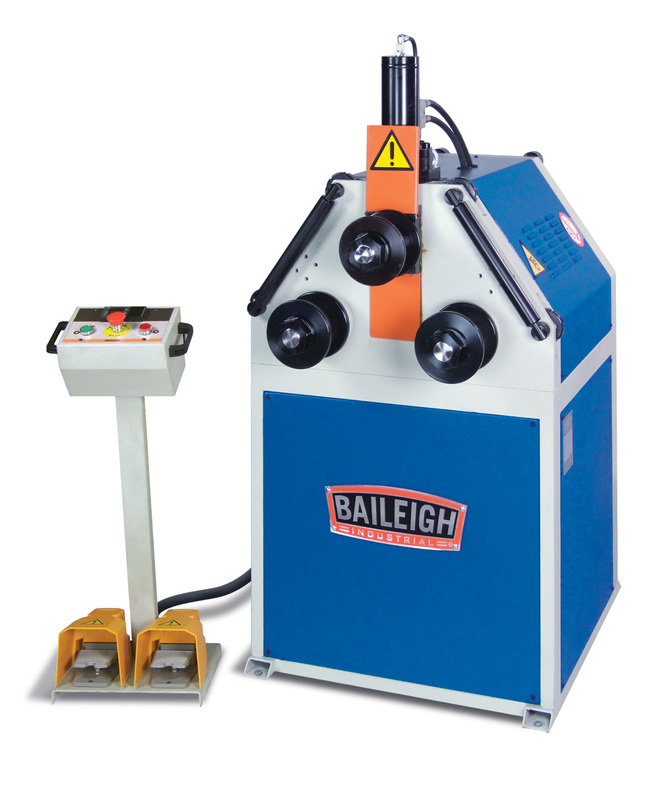 Like all Baileigh hydraulic single pinch ring rollers, this machine has a powerful top roll that uses industrial grade hydraulics. The hydraulic top roll works in conjunction with the programmable digital read out. This DRO can be programmed with the final down position and upward stroke which allows for precise repeatability when doing production runs. The R-M55H ring roll comes with a sturdy frame that allows the operator to run the machine in a vertical or horizontal position. This section bender come with a set of segment rolls that allows the operator to bend certain flat materials, as well as some angle iron applications. Additional section rolls are required for different size profiles like tubing or pipe. Operation of this ring roller is done from an independent operator pedestal that has the digital readout programmer, controls for the top roll positioning, as well as foot pedal controls to engage the direct drive transmission forward or reverse. Baileigh ring rollers offer the metal fabricator a powerful solution when different profiles are meant to be bent. This ring roller offers years of production at a very affordable price.